A picture is worth a thousand words, and these dogs are worth their weight in gold! Take a look! All of our stud dogs are available for a $500 Stud service fee plus one puppy. 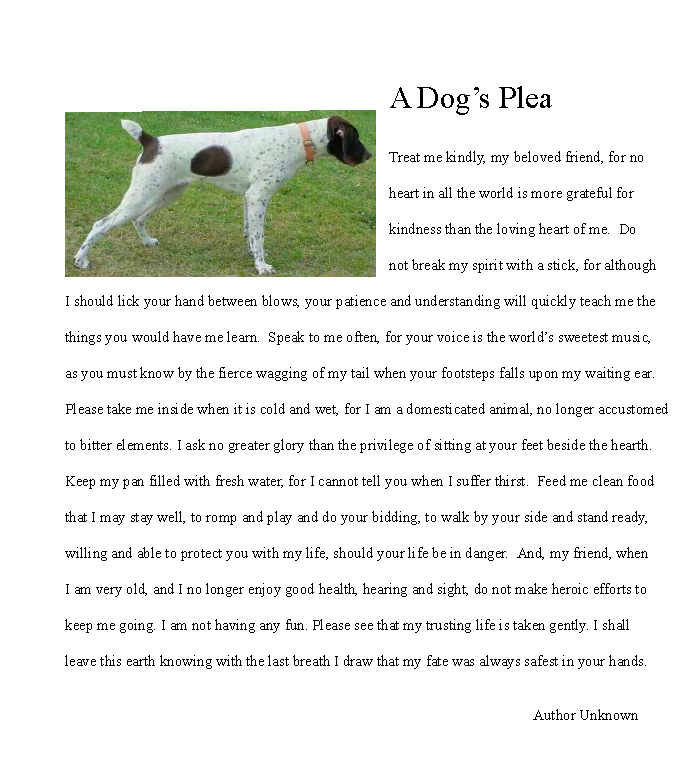 Be sure to visit our Pedigree page for details on these great dogs. Please give us a call for more information. 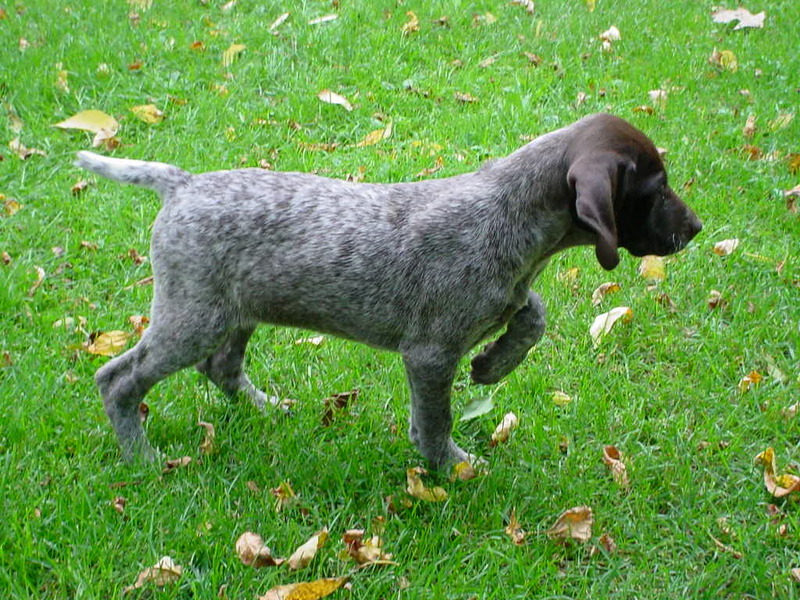 Click on the small picture to bring up the dog you are interested in learning more about. Just hit your browser's back button to return to the website. 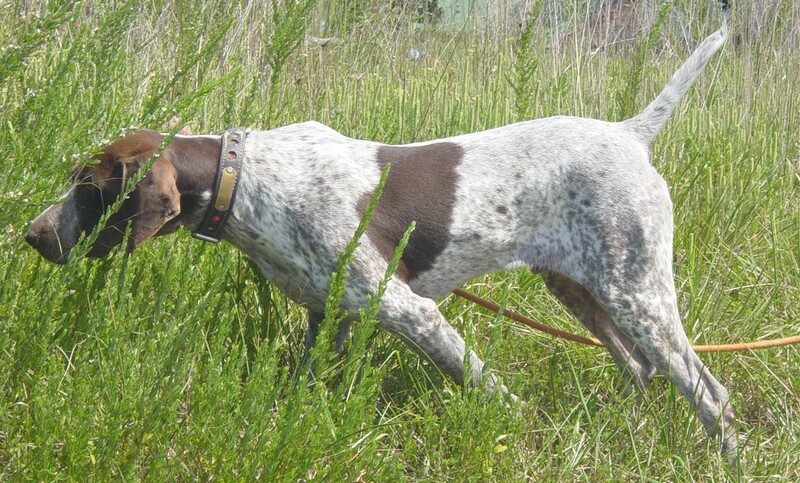 Benny's father is a Dual Champion male from California.He is a great bird dog.He is 67 pounds .He holds a great point and loves people.Check out his pedigree on our pedigree page. This is his 10 month old picture ,He is 5 years old now. Junker is 3 years old and finished on his training.He is a very fast learner.His fathers side are almost all German imports and his mothers side goes back to our Julie.He is going to be a great stud on our farm.Check out his pedigree on our pedigree page. Charlie's lines go back to FC Mule Shoe, Rawhides clown and NFC Heides Mighty City Slicker. He is automatic in the bird field . Very easy going and gets along with everybody. He has had over 500 wild birds shot over him in the last 2 years. Pheasants, Grouse and Chucker ,he works well on all of them. Rooster is a Molly pup and he is coming 4 years old.He has a great point and very nice to hunt over.His pedigree is very good also.Check it out on our pedigree page. 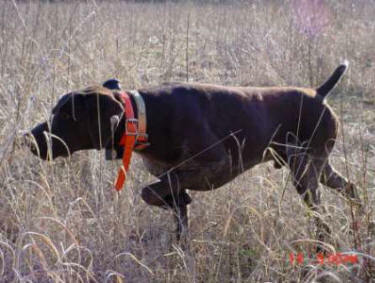 Brough comes from a long line of Champions.His father Buck was National NGSPA Quail CH. Shooting DOG.CH. NGSPA ALL Age CH.Reg. V CH. Runner UP.Great Plains Reg. CH. All Age two years in a row.GSPCA AA Natl's 3rd place.He is also a Field Champion. His mother Kessie NGPDA Nat'l Shooting Dog Champion,NGSPA Shooting Dog runner up,Reg. V AM. Shooting Dog runner up.She is also a Field Champion. BROUGH is an excellent dog in the bird field as well as in the kennel.Great manners and a very laid back disposition.He is a great companion.His pups are great! 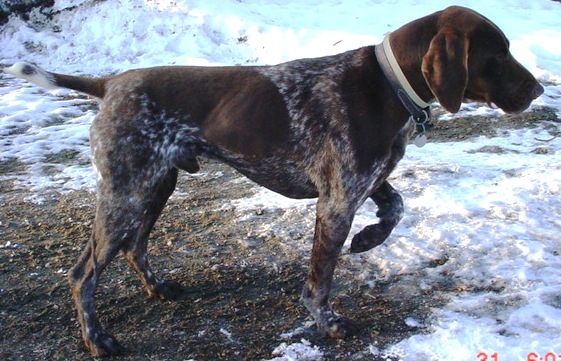 Buddy is a very well bred German Shorthair.He was bred by George & Fern DeGidio.He has 18 Champions in his 4 generation pedigree.His father was a Champion and his mother was a Field Champ. He has a Great Pedigree also!! 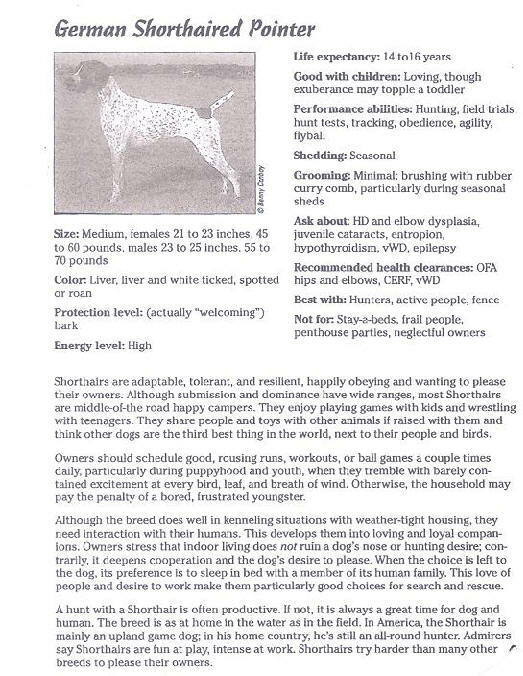 Dutch is a Von Greif bred dog.He was born in 2001 .He is 68 lbs.Dutch looks exactly like the father of the D.C.Flying Dutchman,who was Rip Traff Von Bess.He has a great point and is outstanding in the bird field.Check out his pedigree.His father was a Champion. We are taking deposits at this time.The first deposits will recieve the first picks.A $200 deposit will hold your pick in the litter.The deposits are non refundable, so be sure you want a puppy.$800 is the price of the puppies.Give us a call if you are interested.218 631 2289.